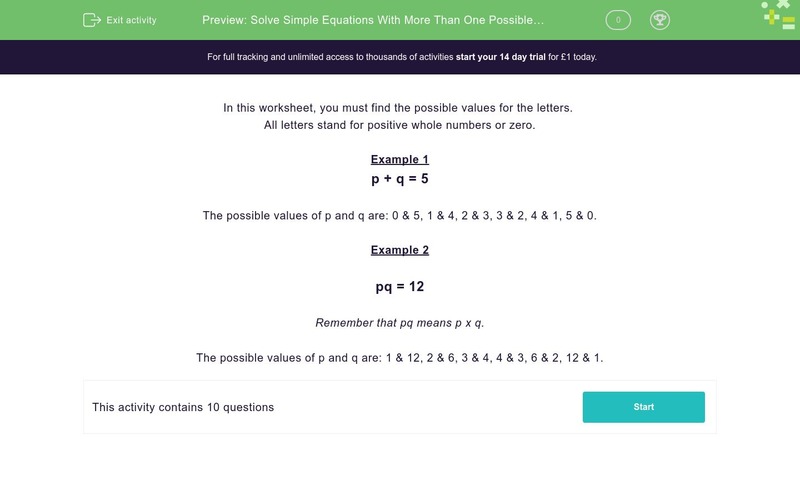 In this worksheet, students develop their algebra skills by selecting possible solutions to the given simple equation (more than one possible answer). In this worksheet, you must find the possible values for the letters. All letters stand for positive whole numbers or zero. The possible values of p and q are: 0 & 5, 1 & 4, 2 & 3, 3 & 2, 4 & 1, 5 & 0. Remember that pq means p x q. The possible values of p and q are: 1 & 12, 2 & 6, 3 & 4, 4 & 3, 6 & 2, 12 & 1. Solve the following equation, where p and q are whole numbers or zero. Tick all the correct solutions.